Dock and folders black again in Plus series on iOS 9.3!? It does not work on iOS 10.2. I prepared a new black wallpaper for 10.2 on iPhone SE/5s/5c/5/ iPod touch 6/6s/6. 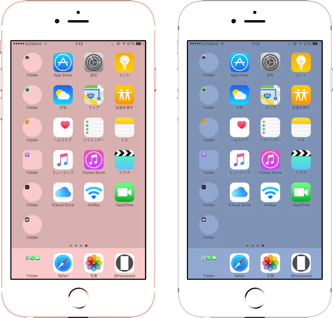 It is probably impossible for 7/6s/6/7 Plus/6s Plus/6 Plus. It is the perfect black Home Screen! This wallpaper makes jet black Dock and folders. Probably, it works on all the iOS 10 device. So suited to the new color iPhone 7 Jet Black (or Black)! Is it an Easter egg? On the normal black wallpaper. If you use normal black wallpaper, Dock and folders are gray. I don't love that. Update to iOS 10 your iOS device (iPhone 7/6s/6/7 Plus/6s Plus/6 Plus/SE/5s/5c/5/iPad pro/iPad Air/iPad 4th or later/iPad mini 2nd or later/iPod touch 6th). November 6 JPN: It may not works on iPad. Tap and hold to save the black image and use as wallpaper. That's all! You'll get the jet black Home Screen! 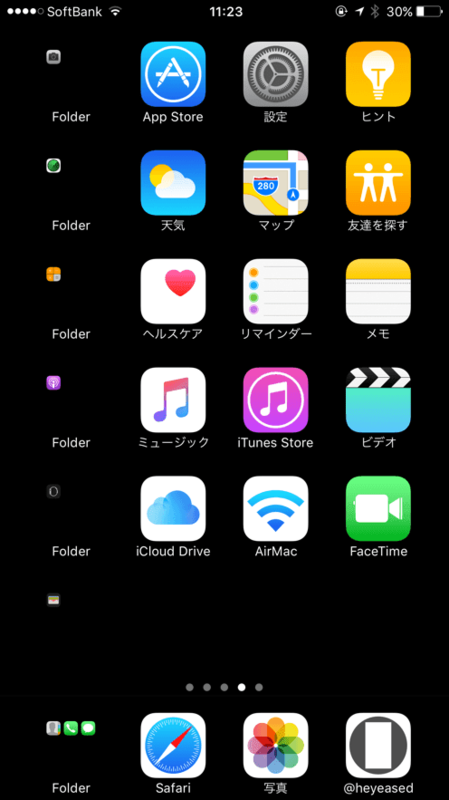 Adding that page to Home Screen gets the black blank icon. 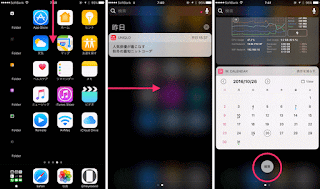 If Home Screen and Lock Screen both black it might be better to choose "Set Both". 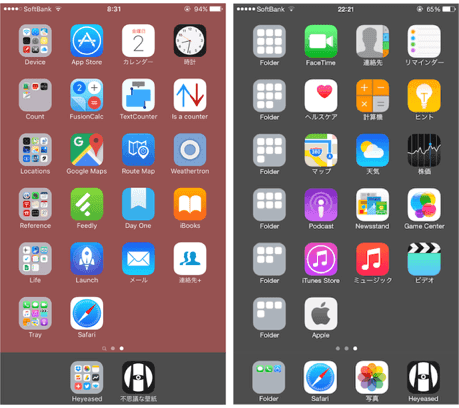 If they display the same, sometimes Home Screen wallpaper is changed to Lock Screen one (Lock Screen takes priority. ), even these have different size or margins for Parallax Effect. It is better to set as "Still". The background never moves. On this wallpaper, "Edit" button of the widget is invisible but you can tap to edit. 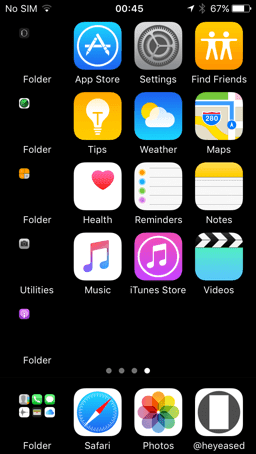 A user told me how to see the Edit button on Black in Black Home Screen. Black in Black is 1×1px image (For sure, It's just a dot, cannot say I made. I named it. I named the hack I found. Don't mention it.). 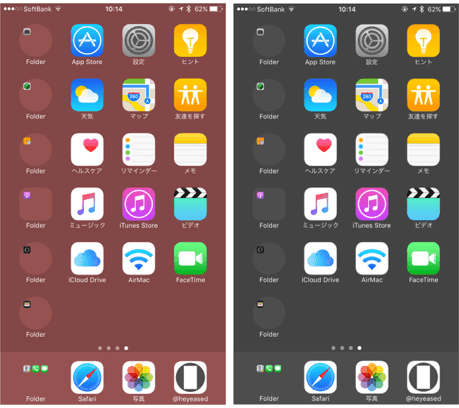 On 1px width and/or height wallpaper, the color of Dock and folders are the same as the original in iOS 10. For example, using 1×1px white, Dock and folders are pure white. 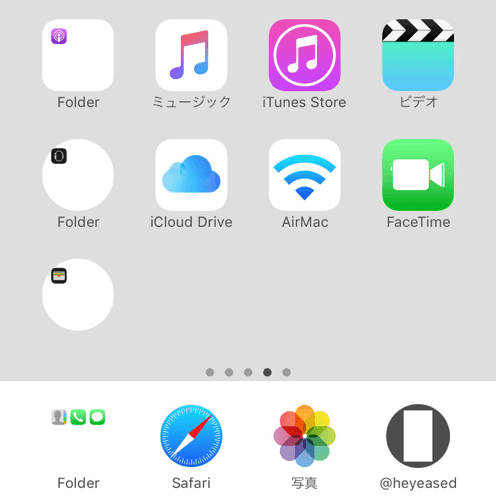 Look the screenshot, Safari/Photos icons or the folder in Dock. The borders are invisible. They are certainly white. Meanwhile, the background is darkened. This rule applies to any color. But nothing is darker than black. The black background still black. Folders are rounded on the other colors, but on black, they are invisible. There are impossibly vivid colors to make clear the effect. Of course you can use as wallpaper if want. All the image is a PNG. iOS 10 (9.3.4 or later) doesn't read 1×1px JPEG (iOS 8–9.3.3 read.). The storage? 1×1 black JPEG is 285 bytes (compressed), PNG is 83 bytes. It is often light a simple picture. 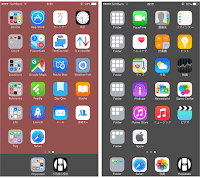 It makes the Dock and folder color collect. The prime concern of me was how works Round Folders in iOS 10. 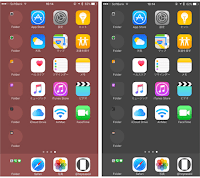 I tested Round Color Folders "black and red" (3×3px) on iOS 10 iPhone 6 Plus. The screenshot iOS 9.3 iPhone 5. The Home Screen background blacked out! Why black? Wrong setting? I know the background is darker than iOS 9.3, the blur effect is stronger. But... Why here isn't any red? It's black!!! This is not the time to say "Not red"! I find the perfect black!? However, on iPhone 5 (iOS 10) this. 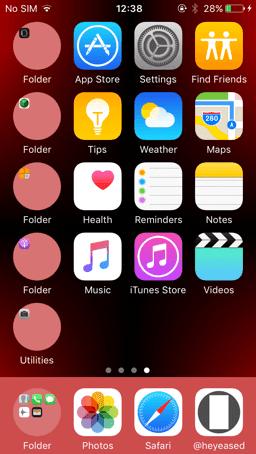 Why Round Color Folders "black and red" worked like that on 6 Plus? 6 Plus has a larger threshold (5px height or smaller! ), perhaps the red was vanished by strong blur effect of iOS 10. Too strong blur effect on 3×3, iOS 10, 6 Plus. 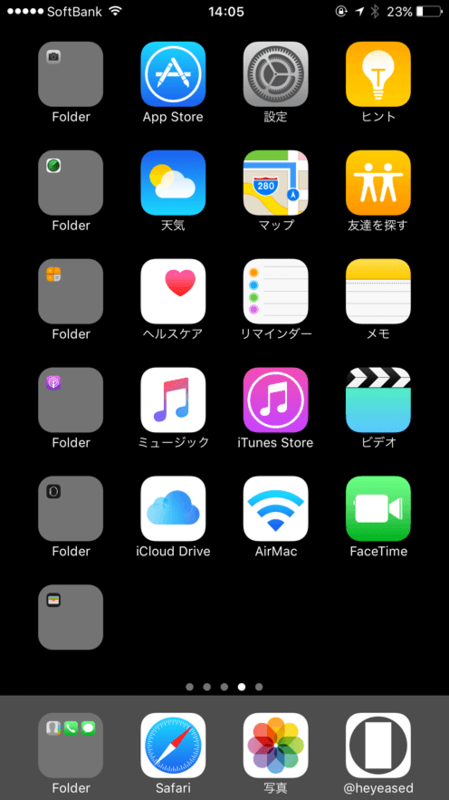 In iOS 8.3–9.3, using 1px width/height image, Dock color was always dark gray (R77 G77 B77, the same as using normal black wallpaper) on any wallpaper. The background is never darkened. It looks fixed in iOS 10. Well... It is hard to find a new trick in the same place. In the future? The history of the 1px wallpaper effect, iOS 7.0-7.1: It could not set to wallpaper (App crashed), 8.0-8.2: Folders were pale blue tone (I vaguely remember Dock had a dark color also on 1px. ), 8.3-9.3: these were gray tone and the background was never darkened on any color, and 10: the background is darkened on any color but Dock and folders are the original color. It has been changed three times since iOS 7. Kaleidoscopic changes? But technically speaking, iOS changed seven times wallpaper effects since 7.0, iOS 7.1, 8.0, 8.3, 9.0, 9.2, 9.3, and 10. That is actually stable. Only three times! If anything will be changed, I will postscript my site and here. Have a nice screen! At the last update the dock en collective mapps returned grey again. Is it possible to create a better wallpaper to solve this? Depending on your iPhone you can use the Magic Black Minus that was added at the beginning of this article. But in other devices black is difficult (probably impossible). From the top page of my Weebly site, you can find various wallpapers that correspond to iOS 10.2, such as perfect white. Can someone teach me how much should i pinch out to make it work for my IP6s ios 10.2. I miss black in black! Anyone? We can not do now. "now". Hi! Any update? The page says it's working for 6s now but can't still manage how. Please help. If you are using iOS 10.2 or later, save the wallpaper from the above Magic Black Minus link according to "How to Save" and pinch out in the setting. Please also read "Notes". Depending on the model, the effect is reset by restart. Please retry 200×7 or 300×9 with pinch out, 4-5 times (There may be a error where the background is black without applies the small wallpaper.). But if your iPhone is 7 or 7 Plus, it doesn't work on iOS 10.3.2. Please tell me when will black dock available for ios 11..
Any chances in future for ios 11 jet black wallpaper??? It became inoperable in all devices. 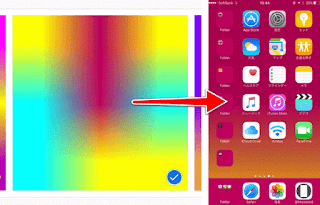 Informative Blog aboutHow to Make the Black Dock on the Black Background without Jailbreak... Thanks for your Valuable Information... MindMajix is providing Online Training on IOS Development Training. Please also tell me how to automatically change the wallpapers of iphone randomly (like windows). 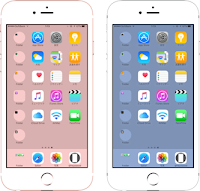 Plus i want to download these Iphone 6s Wallpapers Collectively ! Any Trick please ?? Thanks for sharing this amazing content. Keep Rock.